This post from Brummy Mummy of 2 made me chuckle as my husband and I had a very similar conversation the previous night about children’s television. Freya hardly watches television during the day, as we are usually out and about or playing on the floor with all her toys, but she loves CBeebies The Bedtime Hour and specifically In The Night Garden. As a result I picked that as the theme for her first birthday card, which we hope to get shown on tele. It has taken me months in five or 10 minute chunks to finish it but, as I was sticking the last bits on, I suddenly had a thought….does it look like she is supposed to be Upsy Daisy? And is that acceptable? My husband thinks it looks like she is standing in a bucket but it’s supposed to be grass! As Brummy Mummy says, Upsy Daisy does have a reputation for being “a bit of a one”. This began an ernest conversation between my husband and I about where I should put Freya on the card in relation to Iggle Piggle and also whether it would be better to have Upsy Daisy as well to keep Freya away from the action all together. Then we sort of looked at each other in a “can you believe we are even talking about this?” sort of way and realised that we might be overthinking this ever so slightly*. I think children’s tele has done something to our brains. So, it’s going as it is. Freya’s reputation be damned! Firstly, thank you for being my first commenter 🙂 Secondly, I’m sorry you stopped making your card. I know what you mean though, some of the ones featured look like professional designs! 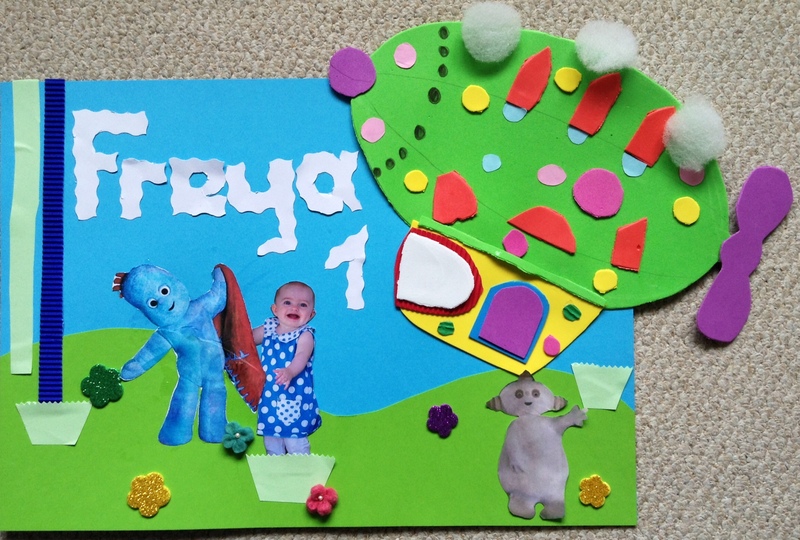 I’m slightly embarrassed by attempt at making grass to cover the fact that I cut Freya’s feet off the photo. Fingers crossed it gets on. Aww thank you. It’s such a silly thing to worry about, I can’t believe we even had the discussion!